-A new Mockingjay Part 2 promo debuted at Comic-Con (where they also debuted the first full-length trailer, which will no doubt land on YouTube momentarily). -Meanwhile, Jennifer Lawrence met Bill Murray backstage and loved every second of it. –Giuliana Rancic is leaving E! News. But who’s going to man the mani-cam?! –Margo Martindale just joined The Good Wife. Sigh. Just when I think I’m out, they pull me back in. –Jake Gyllenhaal just gave another dour interview, this time for Details. How does this keep happening? He always brings his A-game for Ellen. I saw him on a panel with Denis Villeneuve last year and he was knee-bucklingly swoon-worthy. And when I was on the subway last week listening to the part of Starlee Kine’s Mystery Show podcast where he called in to discuss his oft-debated height, he was so cute and flirty that I legit wondered if he was trying to BLUSH ME TO DEATH. (If you don’t have time to listen to the whole podcast, gird your ovaries and start at 27:20). So why are his print interviews such downers? Which profile writer burned him in the past? Does he need to borrow my voodoo doll? -Meanwhile, while Jake is getting glowing articles written about his career trajectory, Ryan Reynolds is … not. -I don’t know what’s weirder: that Kristen Stewart and Kanye West hung out together at Paris Couture Week, or that someone managed to snap a photo in which neither of them look totally miserable. -I’m glad that Joshua Jackson and Diane Kruger are still packing on the PDA, but her arm is really scaring me in this photo. For the love of cupcakes, please let it be just a bad angle. –Michael Douglas took a break from yelling at kids to get off his lawn to blame social media for American actors losing movie roles. -Have you watched Review yet? My brother and I binged the first season over the holidays and laughed our asses off. (It also led to a lot of exchanges that started with “This certainly is an upsetting number of pancakes.”) The season 2 trailer just landed, and one of the things he’s assigned to review is glory holes. I’m dead. –Patti LuPone stole someone’s cell phone in the middle of a Broadway performance for texting because she’s a goddamn boss. -I would like more videos of the Arrow cast challenging each other to try out the salmon ladder. This doesn’t seem like too much of an ask. –Key & Peele’s show returned last night with a feminist pirate song. It was glorious. –Ben Affleck is not only in Jennifer Garner‘s dog house, he’s also in her guest house. -Here’s the first trailer for Brooklyn starring Saoirse Ronan, which got raves at Sundance. Nick Hornby wrote the screenplay so I’m in ’cause we’re BFFs. Well, not really. But once I talked to him while really drunk and he gave me his quill, so that’s gotta count for something. 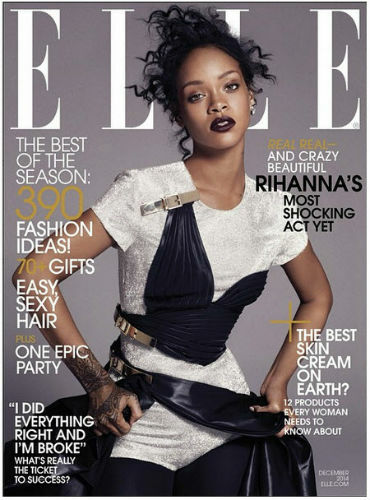 -Is it just me or does Rihanna look really tired on the cover of Elle? -Meanwhile, Rihanna walked the runway at a vogue ball and totally owned it. -Here’s a clip from Wild, the movie that might just nab Reese Witherspoon another Oscar. Is that Herc from FNL? Yes!! -Speaking of FNL alums, this article on the cult of Connie Britton is a must read. “Britton is by no means the biggest star in Hollywood. But if you look closely, she might be one of the most important.” Hells to the yes! -The new promo for Girls is here, which is sure to make lots of people irrationally angry. -The Suicide Squad movie is starting to take shape. (I still don’t get why they don’t just cast from Arrow. Diggle on the big screen? Come on!). Margo Robbie is reportedly in talks to play Harley Quinn, while Jared Leto may try to fill Heath Ledger’s very large shoes as The Joker. -The Macaulay Culkin death rumours were a hoax, which he wasted no time making fun of. -Sorry Shonda Rhimes, I really want to see Brandon Routh’s Christmas cat movie even more now. -I kind of love that Taylor Swift is totally owning her crazy girlfriend persona in her new video. -Of course Eli Roth married a 22-year-old. Of course he did. -The new Broad City promo reminds me that I really, really need to catch up with that show. Abbie and Seth Rogen yelling at a kitten is comedy gold. –Aaron Sorkin says he’s going to quit TV because he’s had “much more failure” than in movies. Wait, are we seriously supposed to feel bad for a guy who managed to get four TV shows on the air, two of which are considered classics? -I love the news that Paget Brewster and Keith David have joined the cast of Community for Season 6, because they’re both made of awesome. -I’m not usually an Elie Saab fan, but I want to be buried in the dress Elizabeth Banks’ wore to today’s Hunger Games premiere. It’s much better than Jennifer Lawrence‘s quilted number. Rachel Bilson and Hayden Christensen in Jumper, the movie that started their relationship. –Rachel Bilson had a baby girl and named her after a Disney princess. So that happened. -Pretty much everyone I know sent me the link this morning to EW’s oral history of Sports Night. Well played, friends. -I love this piece on the Serial podcast and our expectations about a satisfying ending. It’s become an international obsession, but everyone’s treating it like a TV show instead of an ongoing investigation. -Once again, this year is shaping up to be slim pickings in the Best Actress Oscar race. -If this story is true and Christopher Nolan really is interfering with Jessica Chastain’s Oscar campaign, that’s balls. It’s not like Interstellar needs the extra push. –Amanda Bynes fell asleep at a mall. Hey, we’ve all been there, amirite? –Bette Midler and Jimmy Fallon flipped lips and sang “Baby It’s You” — ’cause why not? -There was a new George and Amal Clooney sighting in London. –Taylor Swift says of Spotify: “I’m not willing to contribute my life’s work to an experiment that I don’t feel fairly compensates,” which is easy to say when your album instantly goes platinum. –Lena Dunham’s book tour sounds fun. -I really liked the novel Whatever Makes You Happy, so news that the adaptation will star Susan Sarandon, Allison Janney and Stephen Amell is all good. I really, really hope Amell is playing Daniel. -Here’s the final Hobbit trailer, for those of you out there who care about that sort of thing. -Here’s a new sneak peek at Avengers: Age of Ultron and Ant-Man. You go get that Marvel money, Paul Rudd. -Poo. Beyoncé’s rumored new album track list is “completely made up,” according to her reps.
-As someone who quotes Tina Belcher A LOT, I appreciate this. –Katniss realizes that Peeta is still alive in the latest Mockingjay clip. -There’s a new Into the Woods trailer and this one actually has singing!